Tags: EPT Prague, Leonid Markin. Posted on Friday, December 12, 2014 by "T". The third and final day of the EPT Prague Super High Roller saw the return of seven player from a 41-player field (+10 re-entries). All players were guaranteed a minimum payday of €128,565 and Russia's Leonid Markin held the chip lead when the cards were in the air. Although he didn't maintain the chip lead, Markin battled his way to heads up against Paul Newey after several hours of play. Markin lost the lead to Newey in one of the first hands of heads-up play. With the blinds at 80k/160k, Markin raised to 480k from the button. After a few moments of considering his options, Newey announced that he was all in for 4.4 million. Markin snap-called with A 7 and was behind to Newey's 9 9 . The table ran out J 10 K J 2 and Newey had taken a 2-1 chip. Markin raised to 480k from the button, Newey moved all in for approximately 4 million chips. Markin snap-called with A 10 and was ahead of Newey's A 7 . The flop brought two diamonds, but the remaining two cards didn't help Newey. Leonid Markin was crowned the champion and received €771,360 in prize money while Paul Newey received €557,090 for his runner up finish. 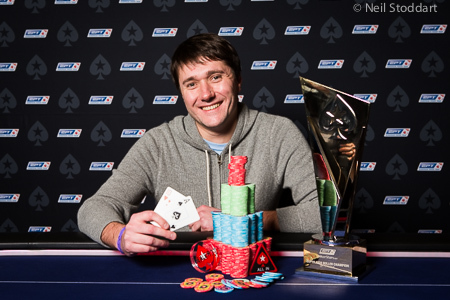 9 comments for "EPT Prague: Leonid Markin Wins The Super High Roller (€771,360)"
At the beginning of Day 2 of the €50,000 Super High Roller event at the EPT Prague Poker Festival, Leonid Markin came to his table and proffered his hand to an opponent. "It's the champion! How are you?" Markin said. It was notable because Markin was not talking to Martin Jacobson, even though the newly-crowned WSOP Main Event winner was sitting to his left. I can't remember hearing much of Markin before so congratulations to him for a great win,if it is his first major win then nearly a million is an excellent place to start . I feel sorry that Paul Newey has still not won a major tournament,half a million for 2nd place would be great for most people but Newey says he just wants to win a tournament.Maybe next time! At the beginning of Day 2 of the &#65533;50,000 Super High Roller event at the EPT Prague Poker Festival, Leonid Markin came to his table and proffered his hand to an opponent. "It's the champion! How are you?" Markin said. A7o vs 99 nice to see he would go to play this hand like a true russian from Pawkerstars. Snap call this where you have 30% chance is truly a great sign you are disciplined and serious player. Great card, great kicker - said no one ever. The rest I really don't care about. Playing reckless paid him well. It wasn't until level four that Leonid Markin arrived. He spotted a massage therapist immediately. "Hey, are you busy now?" he asked, taking charge of the stack of chips given to him by the dealer. But the therapist was, and pointed instead to Zohair Karim in seat one, her next customer. Markin conceded graciously, but it would be his only real loss of the level. The request for a massage seemed unusual, for he looked like the most relaxed man in central Europe. It is really hard to come to Prague in December and NOT be in the holiday spirit. This city is like Christmas personified. With all of the hot wine and cider stalls set up to help tourists get into the swing of things, it even SMELLS like Christmas. This final heads up must have been very nice to watch and uncertain too, giving the number of times they changed control of the game. The Russian took the best out of the game but, just for two hands shown, we can see a part of his strategy, not very different from our amateur knowledge of the game: you have an Ace heads up, feel confident to go all in. The first time he did that didn't run well, but the second represented his victory. Congratulations to him. I was just playing the EPT freeroll tournament on Pokerstars. It was quite a strange tournament for me - like a rollercoaster. In the end I could not reach the money places - as always.